In an emerging market economy with high inflation rates such as India, it is only wise for people to save, invest and spend effectively in order to meet a general increase in prices and fall in the purchasing value of money overtime. People?s savings are necessary to sustain an optimum level of demand which boosts manufacturing, services and thereby jobs in the economy. The government encourages people to save by providing tax deductions to those who do it. 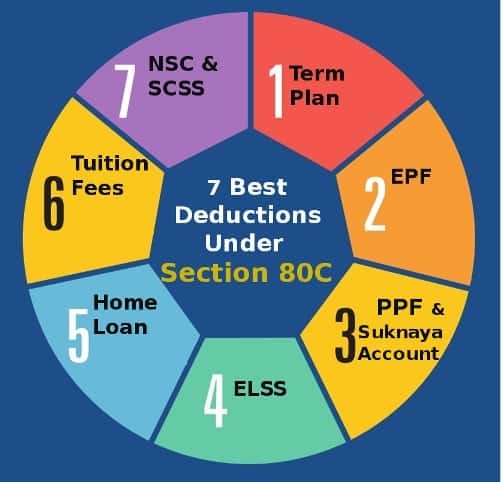 The income tax code provides income tax deductions under Section 80C to Section 80U for various investments, expenses and payments made by the individual or a Hindu Undivided Family (HUF) in a given financial year. This section provides tax deductions under any investments made in an annuity plan or Life Insurance Corporation (LIC) or pension received under funds mentioned in Section 10(23AAB). The deductions under this section are aimed at encouraging people to save. These deductions are allowed to people who avail the National Pensions savings scheme (NPS). Under this an individual can avail a deduction of up to 10 percent of his/her salary or Rs 1.50 lakh whichever is lower, if the person is employed or the lower of Rs 1.50 lakhs or 10 percent of gross income, if the individual is self employed. This is applicable in case of employer?s contribution. Maximum deduction of 10% of salary. For financial year 2015-16 or assessment year 2016-17, this new section provides for additional tax deduction for amount contributed to NPS of up to Rs 50,000. So for AY2016-17, total deductions under Section 80 are available up to Rs 200,000. Lesser of 50% of stock investment value or RS 25000 is allowed to those stock investors whose annual income is below Rs.12 lakh-a-year under Rajiv Gandhi Equity Saving Scheme (RGESS). Deduction up to Rs.25,000 for self, spouse and dependent children and separate deduction of Rs.30,000 for parents is allowed for premium paid towards medical insurance. Deduction of expenses incurred on medical treatment of Dependent Relative is fixed at ? ?Rs.75,000 for 40% disability and Rs.1,25,000 for severe i.e. 80% disability. Claimant is required to furnish certificate of disability from prescribed authority. Deduction is also available on interest outgo on education loan for higher studies. This loan could be taken by the assessee, spouse or children or a student for whom the assessee is a legal guardian. Donations given to various specified institutions and organizations are allowed to be deducted from your income. The deductions are segregated under two categories i.e. 100% or 50% but cash donations exceeding Rs.10,000 is not allowed to claim. A deduction on house rent paid is available to those who are not paid house rent allowance (HRA) by the employer. An individual, spouse or minor children shouldn?t own a home at the place of employment of the assessee to claim this deduction.? Neither the assessee should have a self-occupied residence at any other place. The deduction available is limited to: rent minus 10% of total income or 25% of total income or Rs 2000 (whichever is lower). Even donations given to political party are allowed for deduction without any restriction, but?if it?s in cash and exceeding Rs.10,000, the deduction becomes ineligible. Any Individual assessee who is patentee can claim deduction up to Rs.3 lac. Assessee has to furnish a patent certificate duly signed by competent authority. Any interest earned (up to Rs 10,000) on your deposits in a savings bank account, co-operative society or post office is tax deductible.? This excludes fixed deposit interest income. Physically Disabled persons can claim deductions under 80U of Rs.1,00,000. Assessee is required to obtain certificate from Government Doctor. Apart from the above deductions another important deduction for the assesee having taxable income below Rs.5 lakh is available u/s 87A. The total tax deductions under section 80C to 80U cannot be greater than gross total income after excluding long-term and short-term capital gains u/s 111A. Though no documents are required to submit with Income Tax Return but assessee must possess the proofs of these tax deductions and should furnish if asked. Important Note: The last date for efiling of IT returns has been extended to 31st August only for current assessment year i.e. 2015-16. Disclaimer: All information in this article has been provided by Quicko.com and SimpleInterest is not responsible for correctness of the data. Rebate U/s. 87 A is applicable for 2018-19 A.Y or not? Which section is applicable Upto 5000/- claim under personal medical expenses.? sr LTA amount kahase deduct karte hai .grass amount se ya kisi 80 ke column me dikhana padta hai? By taking loan of fixed deposit , we will be paying interest for the loan. Any provision is their for claiming interest paid in our total income while calculating income tax. If available kindly inform under which section we can take benefit of interest paid. Actually after taking loan from our FD we are getting less income. Banks will give form 16 for actual FD interest given to us. I am seiner citizen and getting monthly Annuity payment from LIC. Is it tax free income? Please clarify the following :- A military pensioner drawing Service pension and disability pension is exempted from income tax, but if he is re-employed in central government job and wants to file IT Return how will be his gross income and net income will be shown in the return because there is no specific column for deduction of military pension is found in IT Return form. If salary and pension are shown as gross income then there must be a column of exemption for entire pension (service pension and disability pension) and there after other deductions under sec 80c onwards can be shown to arrive at net taxable income. CAN A HUF FIRM — INVEST IN NSC FOR 80C DEDUCTION………???????? Sir, I would like to know rebate under Section 80 of Income Tax is over above above of R. 1.50 lakh. There was facility to extend IT deduction with investment in infrastructure bonds. It offered deduction over and above 80C limit of 1.5 Lacs. Where will that fit here? And does it still exists? It was Section 80CCF which has been abolished/discontinued w.e.f FY 2012-13 i.e. AY 2013-14.